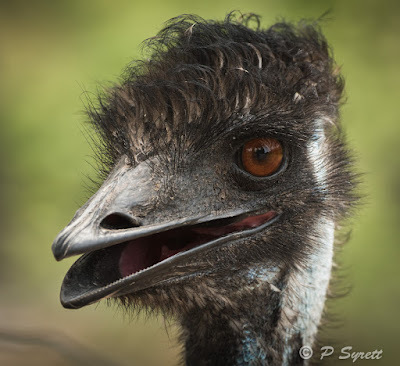 The emu (Dromaius novaehollandiae) is a large, flightless bird, in the ratite group, second in size only to the ostrich (found in Africa). Native to Australia, the emu’s closest relative is the much more rare, and colorful cassowary. 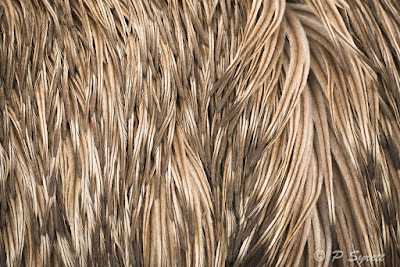 New Zealand’s kiwi is another, slightly more distant, relative. A few emus are farmed in New Zealand, but we also have an opportunity to see them in captivity at our local wildlife park. 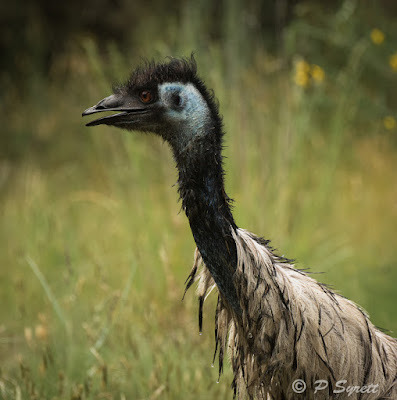 The ones that I have photographed are at Orana Park, in Christchurch. 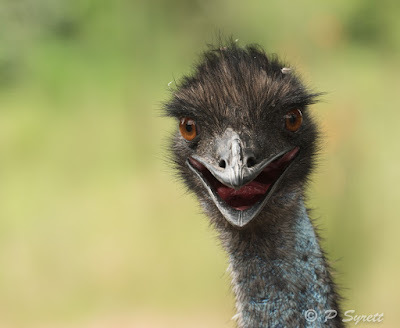 The emu is not endangered, so there is no rearing program for them here, nor are they likely to be the subject of a research project. They are kept at the park so that people can observe them behaving naturally in an outdoor, semi-wild environment. The birds often pace up and down along the fence line emitting a booming sound. It is mostly the females that produce this noise, while males make a grunting sound. An inflatable throat pouch creates the booming, which if emitted at high intensity, may be heard up to 2 kilometres away. On hot days the staff turn on a hose to create a temporary pool in their enclosure, which the emus use for bathing. 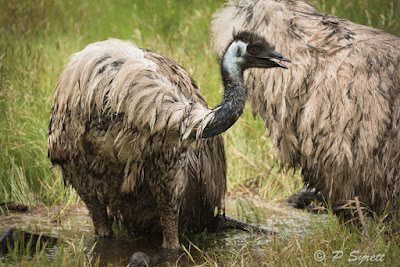 They sit in the pool, immersing their feathers, then stand up and shake off the water. 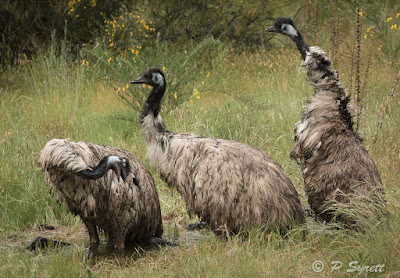 Although they can’t fly, emus can run very fast. They have powerful beaks, so visitors need to be wary of getting too close to the wire. In the wild, they should not be approached, as powerful legs and feet can inflict a damaging kick. 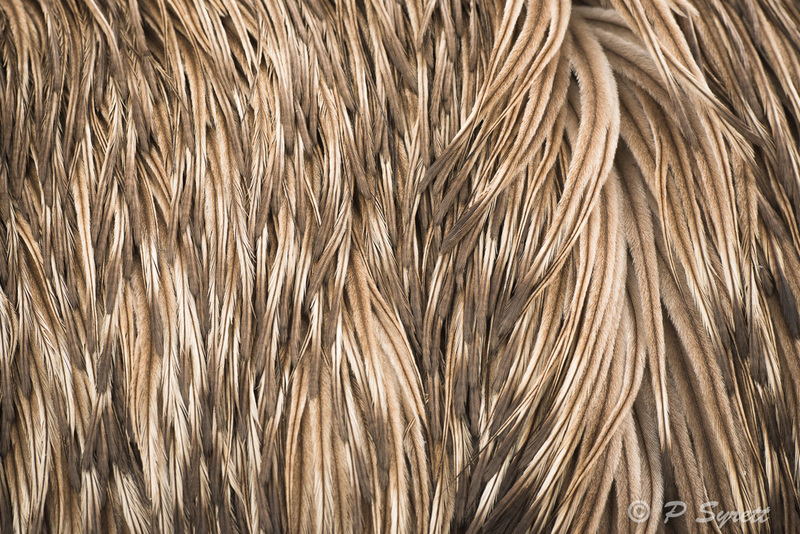 Emus’ soft feathers are very attractive, so it can be tempting to stroke them. However, this is probably not an impulse to give in to!